It’s been over ten years since Anne Rice has released a novel from the infamous Vampire Chronicles. Blood Canticle (2003) was the last installment narrated by Lestat himself. As a treat, also enjoyed in Blackwood Farm (2002), it included characters from Rice’s other popular occult series, The Lives of the Mayfair Witches. In Prince Lestat (release date OCT 28 2014), we are brought back to the Chronicles’ roots. Lestat is back with a number of familiar characters including Lois, Armand, Marius and the Talamasca scholar David Talbot. After Queen Akasha’s death, Lestat became the only vampire known to all other undead. His kind now call upon him to return from exile and restore order to a world where the vampire race is at the brink of destruction. Many new vampires are introduced and together with the new technology available they hope to build a lasting vampire realm. 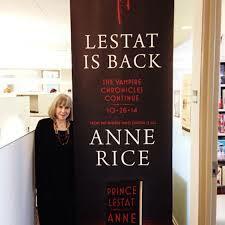 Anne Rice herself has been busy promoting the new installment, most recently in New York at the 2014 Thriller Fest. She will also be at the upcoming ComicCon in San Diego on July 26, 2014 and will be signing older copies of the Vampire Chronicles from 3-5pm. As a celebration of Prince Lestat’s timely return, Anne Rice will be attending the Anne Rice Vampire Lestat Fan Club’s 26th Annual Vampire Ball on Friday, October 31 in New Orleans. Here is a listing of Rice’s novels, click on a title to place a hold.